Swirled with ribbons of Nutella and studded with crunchy bits of toffee, you don't even need a machine for this creamy no churn ice cream. Nutella swirl toffee crunch is the creamiest no churn ice cream recipe! Swirled with ribbons of chocolate hazelnut spread and studded with crunchy bits of toffee, and NO ice cream maker is needed. You are just five ingredients (and a few hours in the freezer, if you can wait) away from a scoop or three of Nutella Swirl Toffee Crunch No Churn Ice Cream. Welcome to Ice Cream Week 2014! This year the event is hosted by Kim of Cravings of a Lunatic and Susan of The Girl in the Little Red Kitchen. We have teamed up with 25 amazing bloggers to bring you ice cream treats all week long. I hope you have as much fun as we did. It’s going to be an epic week of frozen treats! And the beginning of Ice Cream Week also marks the beginning of my house hunting mission in Maryland. So sorry peeps, not a lot of time for rants and witticisms from me. I had grand intentions of getting all of these posts written, like, last week sometime, but as often happens, life gets in the way. So while I don’t have random musings for you, at least I have ice cream. And if you want truly heavenly ice cream, you must have Nutella Swirl Toffee Crunch No Churn Ice Cream. Sure, it sounds like it might take a lot of work, but I think it takes longer to SAY Nutella Swirl Toffee Crunch No Churn Ice Cream than it takes to MAKE Nutella Swirl Toffee Crunch No Churn Ice Cream. The hardest part will be waiting for it to freeze because once it’s done, you’ll want to devour the entire thing. I’ll be honest, I split the pint of heavy cream and can of sweetened condensed milk to make two smaller batches of ice cream (you’ll see the other ridiculously, insanely awesome flavor later in the week), and it’s a good thing because if I had two full batches of ice cream, they probably would have disappeared just as quickly as the two half batches. Birthday ice cream seems to have become a new tradition in our family, so I made these for The Hubby’s recent birthday, and he couldn’t pick his favorite. 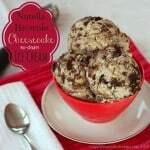 This one is rich and creamy with ribbons of Nutella for a perfect dose of chocolate and hazelnut flavor throughout the vanilla base, then, since I must have texture in my ice cream, pieces of toffee are scattered through for crunchy little bits that add a buttery balance to the sweet lusciousness. Seriously people, you would be doing yourself an injustice if you don’t make this Nutella swirl no churn ice cream! Scroll on down to the bottom to enter! So grab yourself a few scoops of something cold and creamy, make your way to the bottom of this post, and get your entries in! Have you entered and told us your favorite flavor yet? Here’s the Nutella swirl ice cream recipe. Gently fold the vanilla extract and sweetened condensed milk into the whipped cream. Top the cream mixture with small dollops of Nutella and sprinkle over the toffee bits. Gently fold in to create swirls of Nutella and toffee bits. Love Nutella? Love frozen desserts? I can help! « Welcome to #IceCreamWeek – #Giveaway! I’ve made this several times and my family eats it up in no time! The only thing I’d recommend is editing your instructions as you left out adding the 1 t. vanilla there. Oh gosh, Amy. Thank you for catching that omission. I’ve corrected the recipe. I’m glad to hear that your family enjoys the ice cream recipe! I have made it on Sunday. It was so tasty. Thanks for sharing so simple ways to make this. I could definitely go for some ice cream like this. I love Nutella but I’ve never had it in ice cream before! It’s awesome in ice cream!! My favorite ice cream is a strong, rich coffee flavored. I tried a coffee no churn ice cream getting it’s coffee flavor from instant espresso powder. I’m picturing it now with ribbons of Nutella running thru. After trying yours, I may have to try that. Nutella swirl toffee crunch no churn ice cream is definitely my favorite. 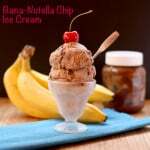 With ingredients like that and no ice cream maker needed anyone can enjoy this wonderful treat! My favorite ice cream flavor is white turtle. White Chocolate Turtle is my new favorite! Oh my yumminess! Nutella and toffee together and it’s no churn!! Heaven on earth right there!! Thanks for sharing! Nutella and toffee work really well together! Thanks Marion! I love anything and everything that has Nutella and this ice cream looks fabulous! Hope the move prep is going well. Mmmmm making this right now! Exactly! You’ve got it all there! Sticky rice sound interesting! Like a frozen rice pudding! No churn ice cream is the best!! I’d love the Nutella toffee crunch ice cream in a coffee base. I always chose coffee ice cream with some crunchy mix. No churn! I’ve never seen this method before, I will have to try it! It really works well! So creamy! I have never in my life had Nutella, but I ALMOST want to risk my life and dive head first into this recipe! (I say risk my life because I have a lot of food allergies). You make this just look SO GOOD! Oh, don’t risk your life! Maybe just substitute fudge! So tasty! That appears to be impressive. What ever happened to the Ice Cream Socials of the good old days. Sure do miss them. My favorite flavor of ice cream is “Moose Tracks” and ” Panda Paws”. Your Nutella Swirl Toffee Crunch no churn Ice Cream looks wonderful. Can’t wait to try it. I might have a new favorite! I am completely obsessed with no churn ice cream. It’s been a long time since I’ve had anything Nutella and I’ve never thought to put toffee in ice cream. Love it! Me too! And I love getting Heath bars on my ice cream, so I figured why not just mix the toffee in! Toffee AND Nutella? No wonder it disappeared quickly!!! Sorry, I don’t think that spoon is big enough, I would be ladling that in!!! My favorite has always been Strawberry, but your Nutella Swirl! Sounds yummy, and I have ALL the ingredients on hand! I’ve never seen a recipe for ice cream without a machine that actually still looks like ice cream! I’m so excited to try this! I’ve had really good luck with the no-churn ice cream! Give it a try! Sweet mother of deliciousness. Nutella and toffee in ice cream is nothing short of pure genius.